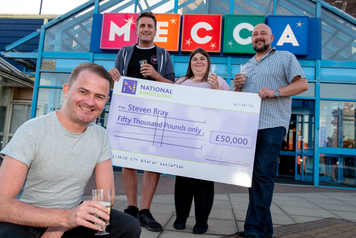 It was a bitter sweet moment for Steven Bray when he stepped up onto the stage at Mecca Bingo Oldham to collect his £50,000 National Bingo Game Jackpot cheque: neither of his parents, who introduced him to the game he loves, were there to see him collect his prize. Steven, a 35 year old hire controller for Hirestation, was enjoying a night at bingo on Tuesday 5th June, when suddenly the evening took an exciting and unexpected turn as he called 'house' on the National Bingo Game, successfully claiming the club prize and a whopping £50,000 Jackpot. Steven is a regular at the club attending one or two nights a week, having been introduced to the game by his late parents: Steven lost his mother to a heart attack aged 55 in July 2011 and his father aged 69 to the same condition only last September. Mecca Bingo Oldham held a special party night for all their customers to celebrate Steven's lucky win on Thursday 21 June, which saw everyone tuck into a buffet and raise a glass as they watched Steven receive his giant cheque on stage. Attending with him were his sister and some of his bingo buddies, who are hoping a little of his luck would rub off on them. "I got introduced to bingo by my late mother and father and have been coming to Mecca bingo once or twice a week for about 7 years. I have won a few times but this is the first time I have won such a big amount of money! The win was a shock and I'm still getting used to winning such a big amount: my mum and dad never won such a large amount when they were alive, so may be the win is a gift and bit of luck from them." "Bingo is a little bit of me time, away from a hectic life: I have two jobs that keep me extremely busy, so it is nice to take a relaxing break. Bingo is a good buzz, especially when waiting for that last number to be called and it's good to meet new people: it's a laugh and you never know you could win big. It was great to get my giant cheque, as I still can't quite believe it." "My long term plans are to pay off some of my mortgage and have a few holidays as I like to go abroad as much as I can: I have been looking at the Maldives, as I have always wanted to go there and now I will be able to. But first up is hosting a thank you party at my house for family and friends, with the food and drink on me: we will toast my parents." 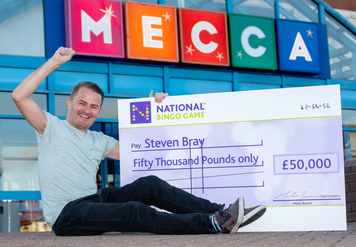 Tony Beverley, Club Manager at Mecca Oldham said: " It was great to see one of our longest standing players win the National Bingo Game: he really couldn't believe it when we told him there and then that he had won a £50,000 Jackpot. The whole club cheered and we are thrilled to be a £50,000 Jackpot winning club on the new National Bingo Game." "We are thrilled for our lucky £50,000 Jackpot winner at Mecca Oldham and hope that he enjoys his winnings, and of course his trip to the Maldives. We love making winners and this is our eleventh £50,000 Jackpot winner since the end of April this year, when the new game launched."